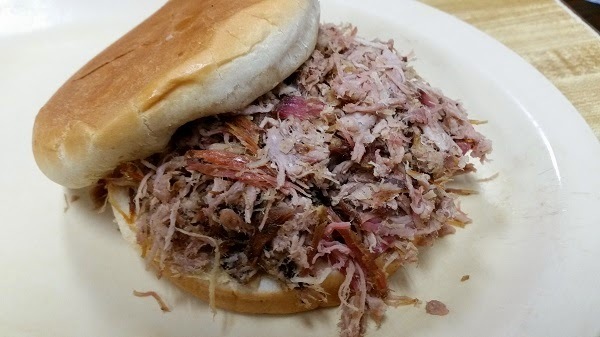 Golden Rule Bar-B-Q, Irondale AL – Marie, Let's Eat! For our final stop on this road trip, we visited one of the oldest restaurants in the southeast. Golden Rule Bar-B-Q is on at least its fourth set of owners, and the current home of its flagship store is, again, at least the fourth, but it traces its history back to 1891, when a family named Williams opened the original stop on the long Alabama to Birmingham highway. In the late 1930s, a gentleman named Jabo Stone, who had married into the Williams family, became the owner. He sold it in 1969 to Michael Matsos, and, in 2010, CM Foodservice, LLC took over Golden Rule as well as Matsos’s popular Michael’s Steakhouse. They run a few other small brands with locations dotted around the southeast, including La Paz, which, until recently, had a store within walking distance of my childhood home in Vinings GA.
Golden Rule has definitely had its ups and downs as it has tried to expand. For a couple of years in the early 2000s, there were two stores north up I-575, in Jasper and in Ellijay GA. Their website presently lists eight full-service locations in central Alabama along with a couple of conference center stops in Birmingham. There’s a notation for a Corinth MS store that’s “coming soon,” but I also found a real estate listing for a former Golden Rule in Corinth, asking price a million four. A Golden Rule opened in Oxford MS in September 2013, around the same time as an Ezell’s Fish Camp. Both have since closed; at the time, Ezell’s was listed as another CM brand. It’s no longer listed on their company’s page. The only Ezell’s that I can find that are definitely still open are now called Ezell’s Catfish Cabin, with locations in Columbus GA and Bessemer AL. Anyway, it looks as though Golden Rule has expanded a few times and contracted again to its core area around Birmingham. There was even a short-lived attachment to Mrs. Winner’s at one point. Now that’s how you dilute a brand’s power right there. At the Irondale store, things seem to be caught in the 1960s, far from all this talk of brands and franchising companies. It has that distinct feel of a very old restaurant that invested in all the red-glazed brick that still lines the floor and the walls, and which was popular for a few years before becoming lost in time. After decades, there’s an indefinable aura about this place, the same vibe that I get at The Beacon in Spartanburg SC. Apologies, that’s very nebulous, but there’s something that hangs in both restaurants’ atmosphere, probably trapped in the glazed brick, and gives me a pleasant smile. Marie and our son shared a gigantic slice of pie, since they were satisfied with their lunch at Gus’s Hot Dogs earlier. 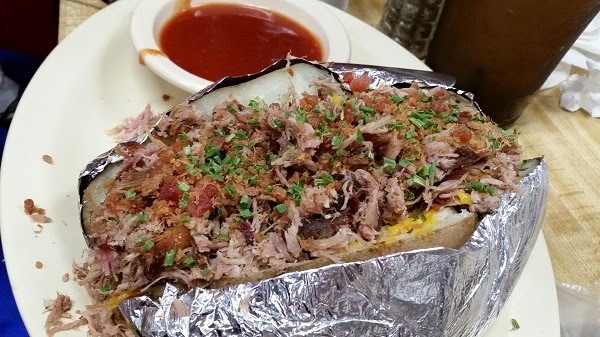 The girlchild, who skipped lunch there, enjoyed a baked potato topped with chopped pork, and I had a chopped pork sandwich. The meat was smoky and dry, and kind of needed a little sauce. The house sauce is tomato-based with a little vinegar, but they also offer a white sauce as well. I split my meat down the middle and went half and half with each sauce. To me, it tastes about average for chopped pork in Alabama. I’ve visited several places here and there that I’ve enjoyed more, but this was a perfectly fine little stop. I love the huge indoor fire pit. You just don’t see this often enough around Atlanta, but lots of places around Alabama have them. Golden Rule has a nice, big one. It smells terrific in here, and tastes pretty good, too. We were pleased with the food and the service and the prices, and think it’s a shame that they’ve had so many stumbles trying to grow. So perhaps they should quit, rather than fumbling around with franchises in Ellijay and Oxford and Mrs. Winner’s. 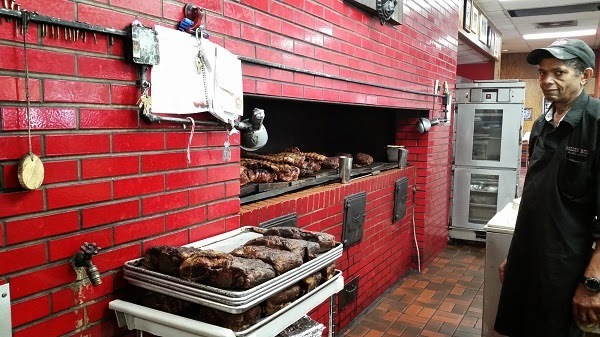 The very best barbecue places – all of them – have a single location where the quality can be scrutinized at all hours. This place is good enough, and old enough, to warrant a visit. Posted on April 29, 2015 August 27, 2017 by Grant G.Posted in alabama, barbecue, birmingham, local chainsTagged alabama, barbecue, barbecue - white sauce, birmingham, local chains. This place does feel like a barbecue time machine, similar to the vibe at Old South in Smyrna, to me. Dang, just thinking about Old South has me craving it for lunch. Might have to get over there again soon. Didn’t you try that new place on Marietta street near your office? Did I miss that review? Yes, Twin Smokers BBQ – I just sent a coworker there for brisket yesterday, in fact. It’s very good. Interesting report. I remember the Golden Rule restaurant in Ellijay and in Jasper, but I never saw one in a Mrs. Winners, and I used to like eating there when I was in Atlanta. I’m not sure how widespread they were in Mrs. Winner’s, or for how long. I think that Mrs. Winner’s was already falling down the hill by 2009 – their website today says that they are down to just twelve stores – and it’s evident that Golden Rule couldn’t stop the bleeding. Thanks for the comment! I wanna say I’ve been to this place once while visiting Jeff and Nettie. Long time ago. 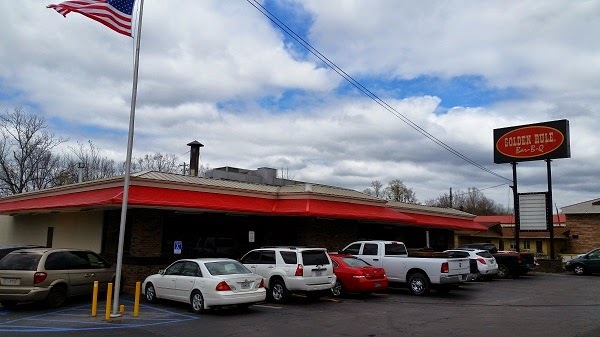 The location on Barrett Parkway near Dallas Hwy in Marietta where Vincent’s Italian Restaurant is now located was originally built as a Golden Rule BBQ. This old restaurant directory, http://www.restaurantguideatlanta.com/mariettarestaurantguide.htm , shows the address as Ridgeway, however that was one of the roads consumed by Barrett in its expansion into a commuter corridor. What a terrific resource – Big Ed’s and Bell’s are on there! Thanks for sharing it. My guess is that it dates around ’95-97 range?